Harvesting Vegetables - 3 Keys To Get Peak Production From Your Garden! 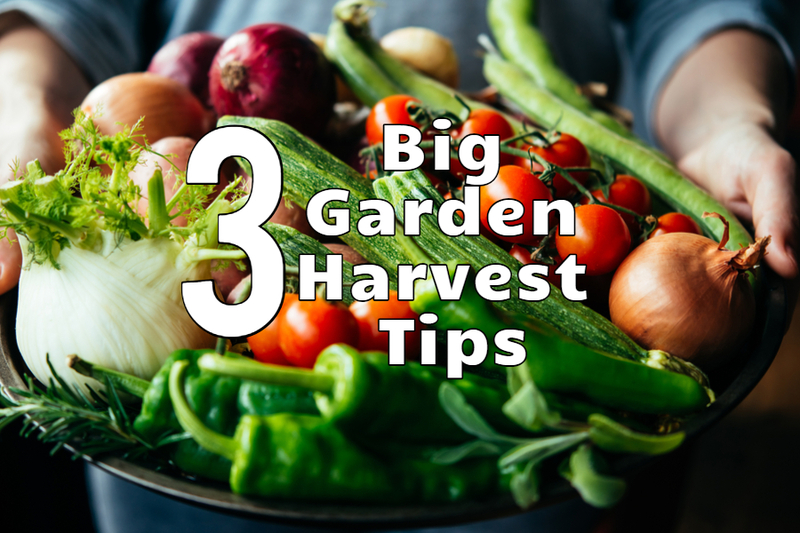 So much work goes into garden planning and planting, that sometimes gardeners forget how important the process of harvesting vegetables is to the overall success of a garden. But good harvesting techniques really do matter when it comes to the continued production levels of plants. Here are 3 big keys to harvesting vegetables, and how to get the most from your summer garden! With most vegetables, the more you pick, the more they keep producing. For the majority of vegetable plants, the more you harvest, the more a plant will produce. One of the biggest mistakes gardeners make is to not harvest on a regular basis. Allowing a plant’s fruit to become overly ripe, or go to seed, sends a signal to the plant to stop producing new blooms. It is called vegetable or fruit overload, and it can stop a plant from producing quickly. When too much energy is used in the ripening of existing fruit, vegetable plants simply shut down the process of making new blooms. Picking vegetables at the moment they ripen encourages a plant to keep on producing blooms. And more blooms means more vegetables. This is true for peppers, peas, zucchini, cucumbers, squash and nearly all vegetable plants including indeterminate tomatoes. The one exception is determinate tomatoes. Determinate varieties are bred to create and bear all of their fruit at once. Heirloom varieties on the other hand will keep bearing fruit until frost, and constant picking helps keep plants producing. Good harvesting habits lead to a good harvest! Much like a plant spends energy on the ripening process, it also spends it on repairing damage. When a plant has damaged or broken stems or limbs, it uses excess energy to attempt to seal or repair the damage. Energy that should be used to create and ripen more vegetables. The same goes for damaged or rotting fruit on plants. By removing damaged limbs and vegetables from the plant immediately, you keep the plant’s energy focused on production. Also be sure to remove any foliage that shows signs of disease. Black rot, blight and mildew disease can spread quickly if left unchecked. #3 Pick Carefully And Watch Where You Walk! Remember when harvesting to pick carefully. In addition to the ripened vegetables you are picking, there are tender new blooms on plants as well that create future harvests. These blooms are vulnerable, and can be easily knocked off during the picking process. As you pick, be sure to keep from walking directly on top of the root zones of your vegetable plants. Stepping on the root zones will compress the soil and roots. When roots become compacted in heavy soil, it becomes hard for nutrients, air or water to get to the plant. And that can spell instant trouble for any vegetable plant! Share your backyard garden tip, or the story of your garden with us! Email us today at info@thisismygarden.com, and you could be our next feature! This article may contain affiliate links. March 1, 2017 ThisIsMyGarden Comments Off on 4 Great Flowering Shrubs and Bushes For Incredible Curb Appeal!